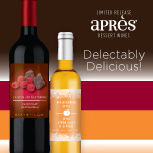 We’re accepting pre-orders for the late fall releases of 9 different dessert wines. This year’s selections include a few new varieties in addition to all your past favorites. Click HERE to learn more and get your order in today! If you’ve never made one of these simple kits in the past, they’re designed to produce intensely flavored, sweet wines in only a few weeks. Producing 3 gallons of finished wine, packaging these in splits (375mL bottles) and dressing them with the labels provided, makes ‘delectably delicious’ gifts during the holiday season.